Our graphic novel ‘Strong Voices: Stories of Struggle & Strength Living with HIV’ is now available! Working with very tight timelines to put this project together, our first step was to find 4 Aboriginal people living with HIV who were willing to share their story. 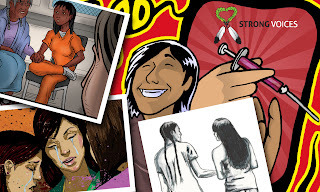 We also needed to recruit 4 Aboriginal artists to develop these stories into picture form. Most importantly, we had to find one writer who was able to bring these stories together into a single book. The first thing we did was put up posters calling for Storytellers. This was not an easy task – as in many communities, HIV is stigmatized and people are not always comfortable talking about their experience. Bill, who works with Peer Support and as a speaker for AIDS Calgary, had volunteered before the project had even started. As a long-term survivor with 28 years living positive, Bill shares his story of how he became an advocate for awareness in Aboriginal communities. Bill is from a Métis settlement in northern Alberta. Keegan Starlight, a local artist from Tsuu T’ina, provided the artwork. Michelle was one of the first people to call about participating in the project. From southern Saskatchewan, Michelle was raised in the city where she attributes her introduction to hard drugs at an earlier age. In and out of prison for most of her life, Michelle was able to reconnect to Aboriginal teachings through prison programs. She attributes her healthy lifestyle to Native spirituality and her family. Grant Smith from Edmonton provided the artwork for Michelle. Aaron, a young man from Saskatchewan was adopted as a baby into a non-native family. Growing up he travelled across Canada and the states by hitch-hiking and train-jumping. While living in Vancouver he found out he was HIV+. With support of his family he is able to have a positive attitude and hopeful outlook. Tank Standing Buffalo provided art work for his story. For the final interview we contacted Krista, an HIV+ mother who has given birth to HIV- children after her diagnosis. Krista is an advocate for HIV+ mothers, having faced discrimination and stigmatization in the medical system herself. Krista shares how she got to where she’s at and how her family has been her support and source of strength. Lydia Prince from Prince George illustrates her story. With the guidance of the Strong Voices Advisory Committee and a local Blackfoot Elder/Cultural resource, we were able to include the medicine wheel teachings and provide examples of these teachings throughout the book. The goal of this book is to bring awareness of HIV to the Aboriginal communities, where HIV is currently considered an epidemic. Due to social determinants and stigma, Aboriginal people are often diagnosed with HIV at a younger age and at later stages (with an AIDS diagnosis for example). Since 25% of Canadians who have HIV do not know it, our goal is to promote testing and harm reduction approaches while building awareness and support for those affected by HIV.